Traditional Herbal Medicine used for the relief of indigestion. Adults and Children 12 years and over: Drink 1 cup (2 tea bags) 3 times a day between meals. Children 6 to 12 years old: Drink 1 cup (1 tea bag) 1 to 3 times a day between meals. Pour 240 mL of freshly boiled water over 1 or 2 tea bags and steep, covered, for 5 to 10 minutes. Gently squeeze the tea bag(s) to release the remaining extract. 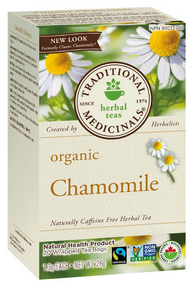 Each tea bag (1.3 g) contains: organic chamomile flower* (Matricaria recutita) 1,300 mg.
Organic Chamomile: Fairtrade certified and sourced from Fairtrade producers. Total 100%. Cautions: Consult your healthcare practitioner if pregnant or breastfeeding, prior to taking this product. In acute cases, that last longer than 1 week or periodically reoccur, consult a healthcare practitioner. Do not use if you have an allergy to Asteraceae/Compositae (daisy) family.